I love my ball, I love my ball!! 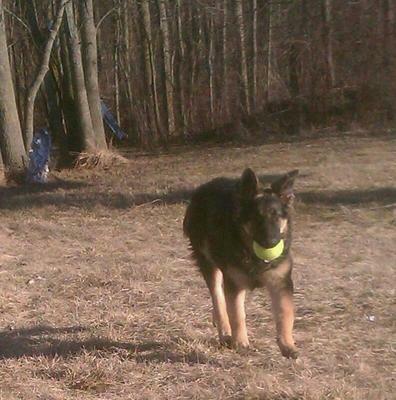 Hi everyone, Ruger and I have been playing ball in the backyard since the snow melted. I am astonished at how much he continues to grow. He will be 6 months on April 14 and now weighs 72 pounds, 25 inches at shoulder, 26 at his highest rump point, and 30.5 inches long from chest to back of thigh. I brush him everyday since he is long haired but I was always told long hair shepherds dont have an under coat. So what is this fuzzy stuff I get in the brush? Its an undercoat!! So is there a longer stock coat Shepherd? Not all long but longer than short? Here are some pics you all tell me. No matter what, I love my beautiful boy, he is a big teddy bear!! Most long haired GSDs have an undercoat - I don't know why people say just the opposite - at least all the one's I've ever come in contact with. I have owned several coated German Shepherds in the past and they all had undercoats. 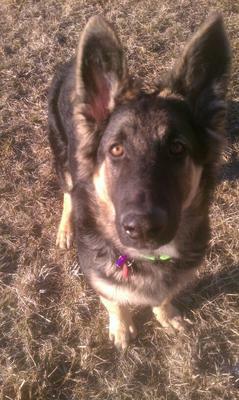 Funny thing is, they typically don't seem to shed as much, in my experience, as a more traditional coated GSD. So I always thought that was a little weird. Don't get me wrong - they still shed (the longer coated dogs) but just doesn't seem to be as much as my standard coated GSDs always do. 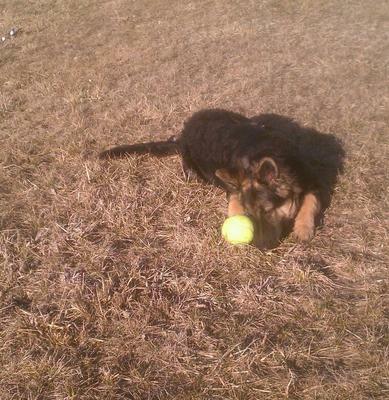 Anyway, continued success with Ruger - he is a handsome fellow for sure - and keep the pictures coming. We love to see them! Comments for Ruger the Magnum Puppy!! He's a huge boy for only 6 months old. The biggest shepherd I've ever seen in fact. Your boy might be right up There someday. Were rugers parents big too? 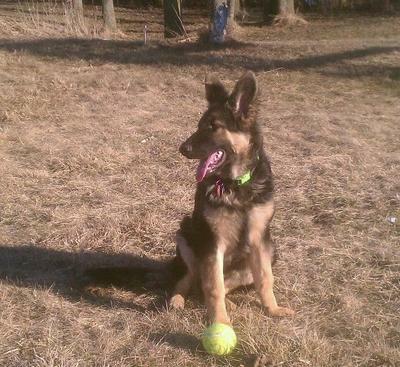 We have kaysa now, she is 3, will be 4 in sep. My girl is around 73 pounds. :) petite head but big clompy feeties. Ruger is a Handsome pup and he is so big now. He loves to play ball. He does have a serious side of him when he will get in his protective mode. German Shepherds are Amazing breed! Take care of you boy and he will take care of you.